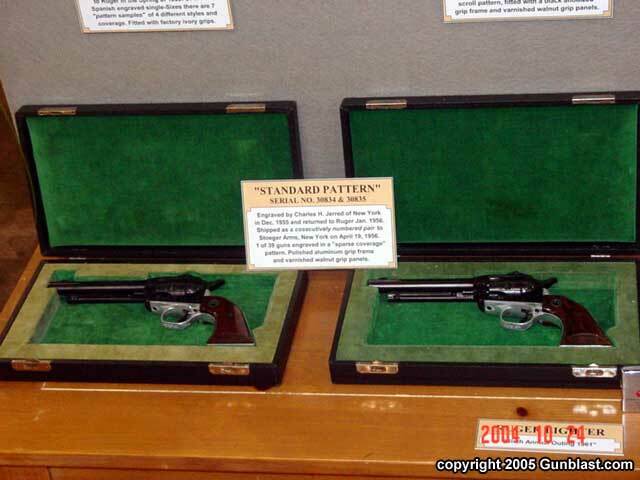 John displayed thirteen mint factory engraved Single-Sixes!! 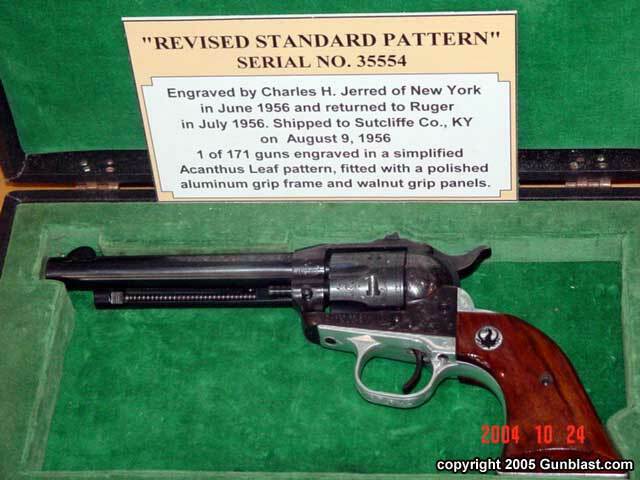 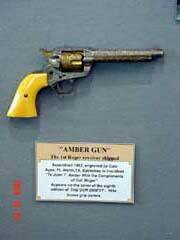 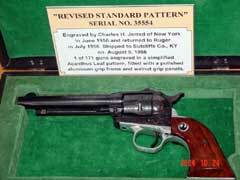 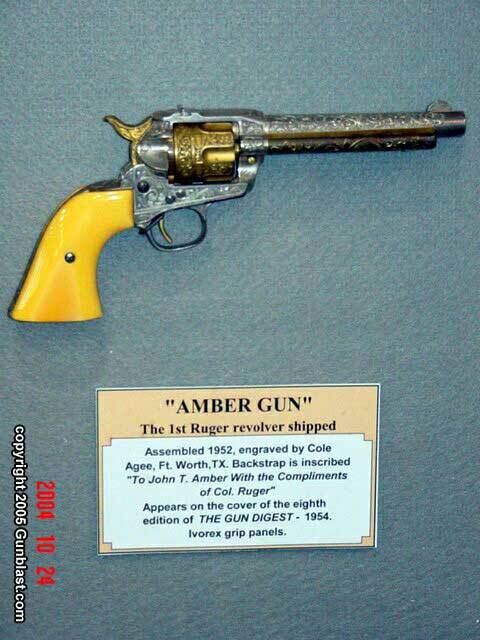 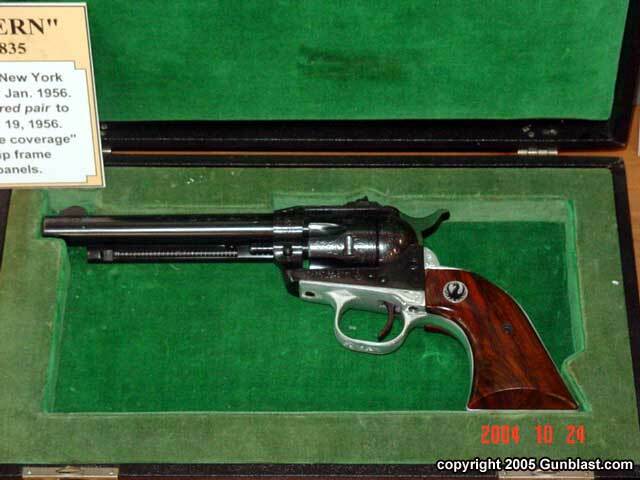 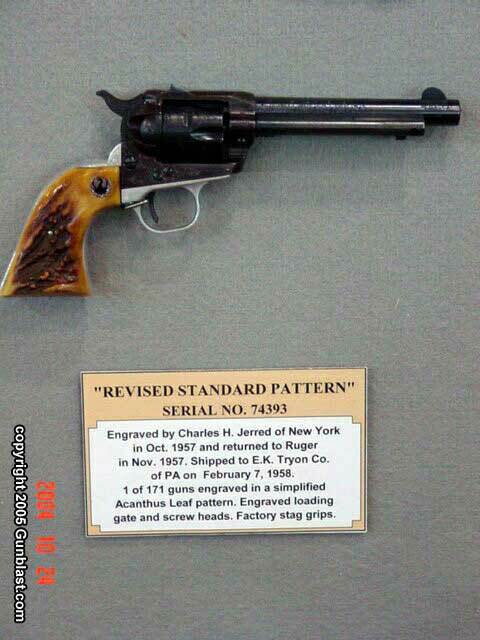 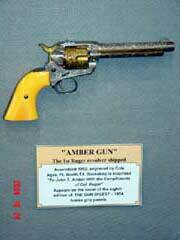 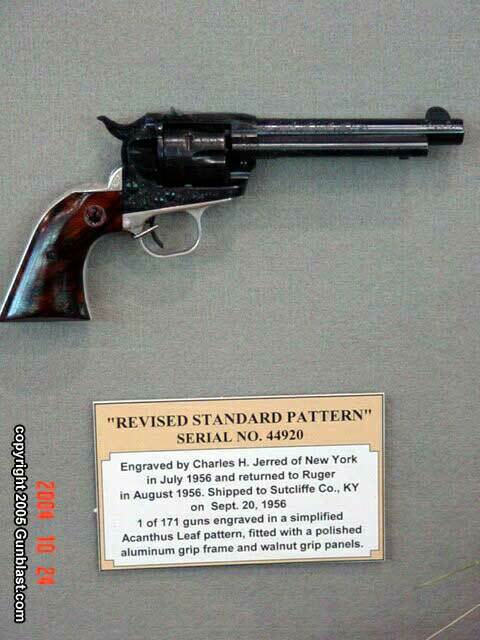 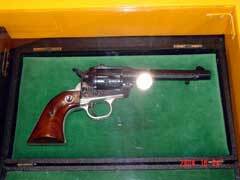 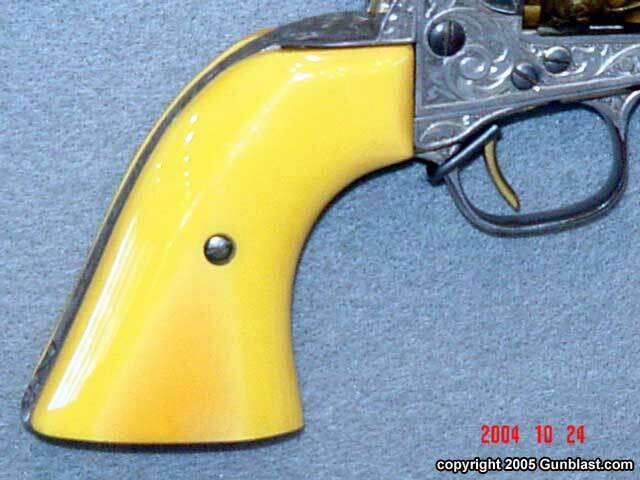 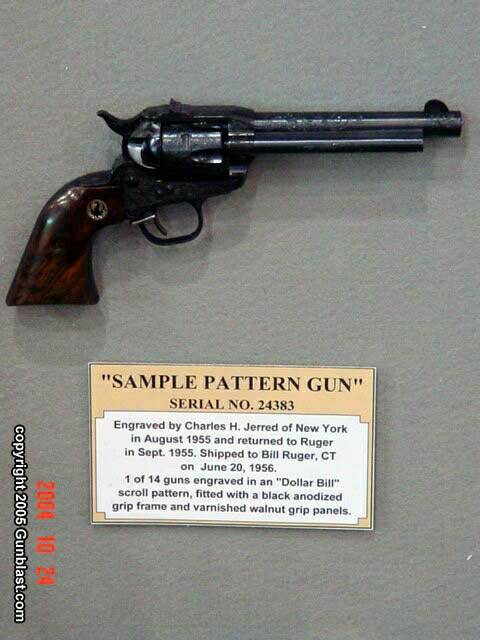 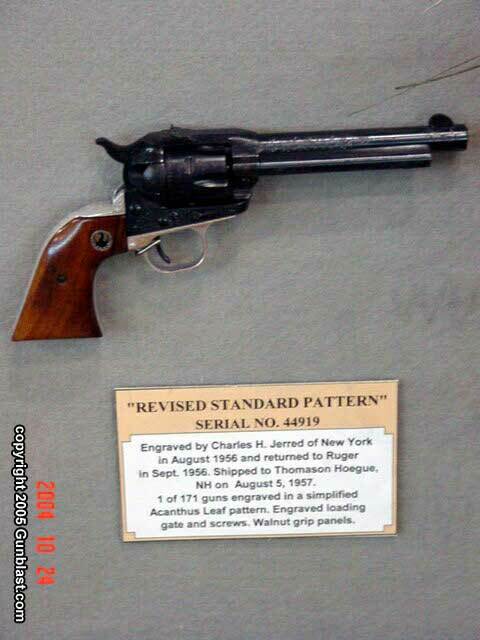 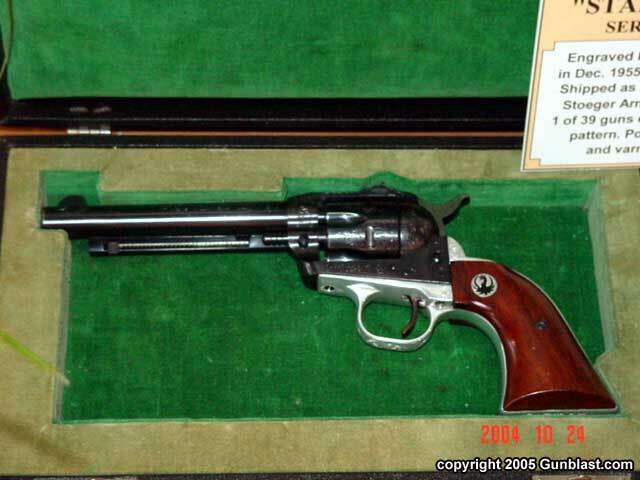 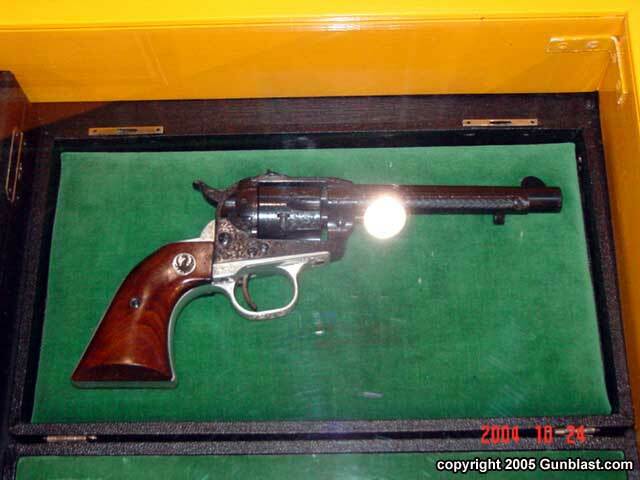 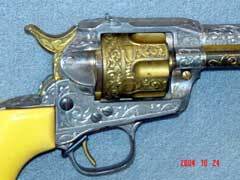 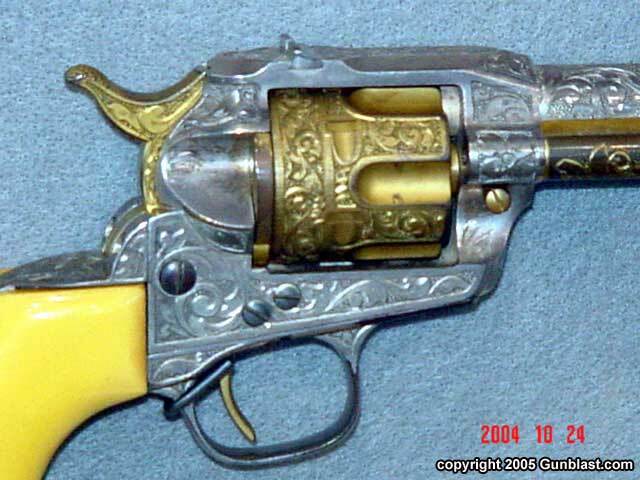 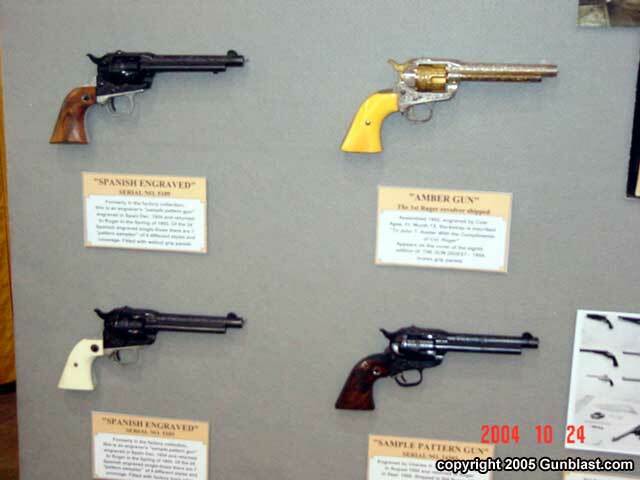 Of special merit was the first Ruger single-action to bear the marking STRUM, RUGER & CO., SOUTHPORT, CONN., USA, the “Amber” Gun!! 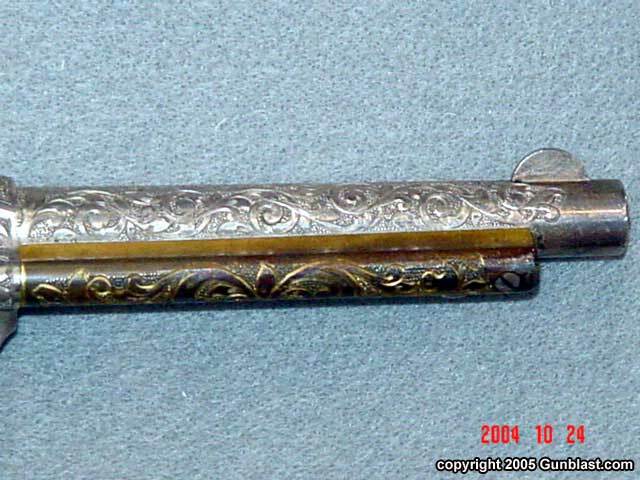 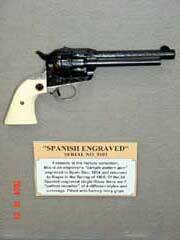 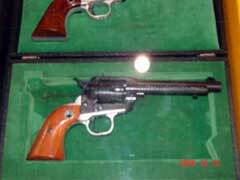 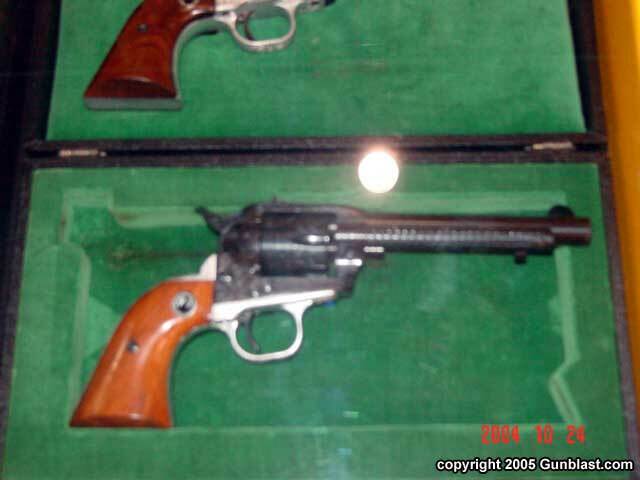 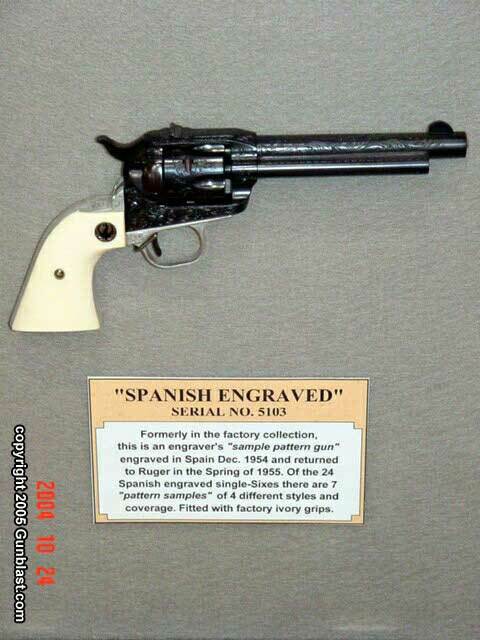 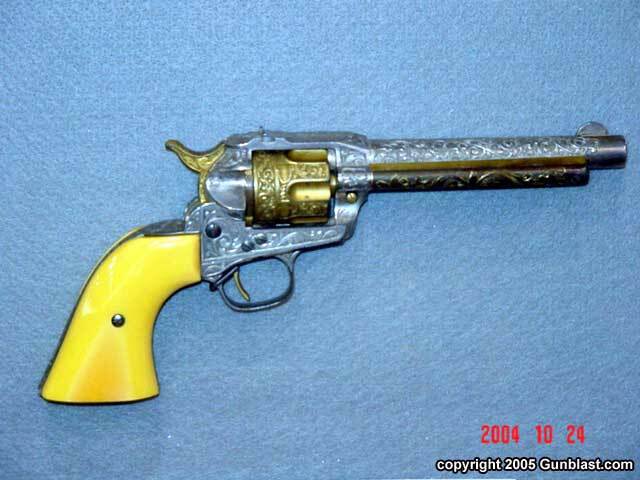 Also included were two Spanish “pattern sample guns”, each featuring a different engraving pattern and both formally in the factory collection. 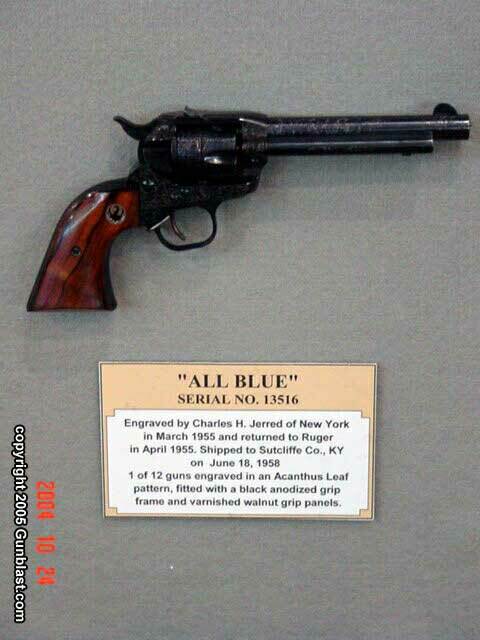 An “all-blue” that was originally shipped to William B. Ruger and a consecutive numbered pair that was originally shipped from the factory as a pair. 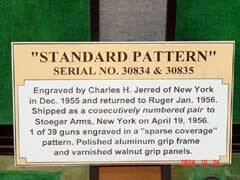 All Jerred patterns and revisions were represented, including screws and gates. 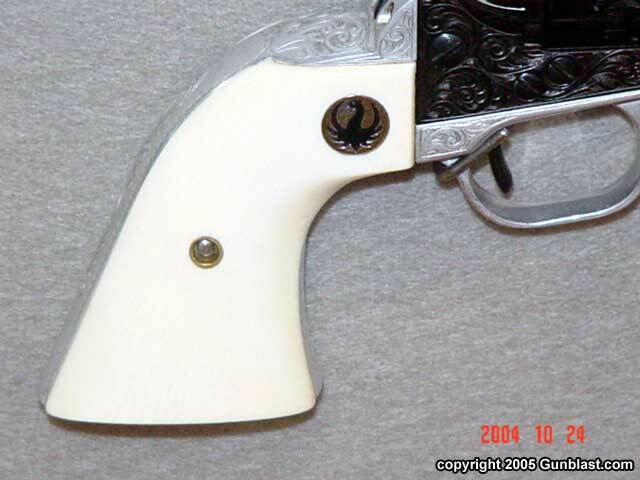 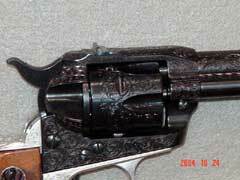 Factory ivory and stag grips were present. 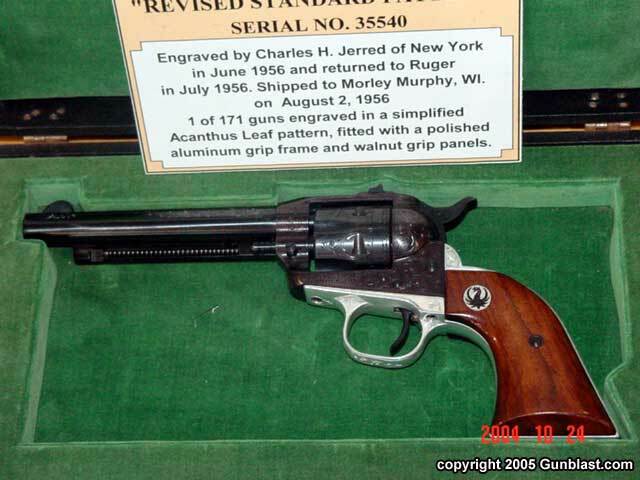 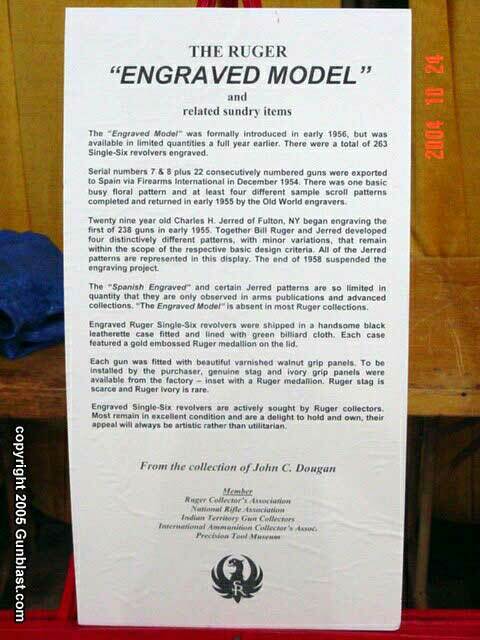 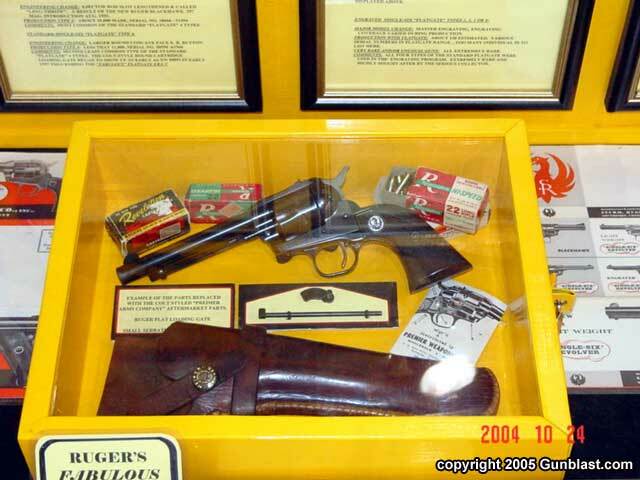 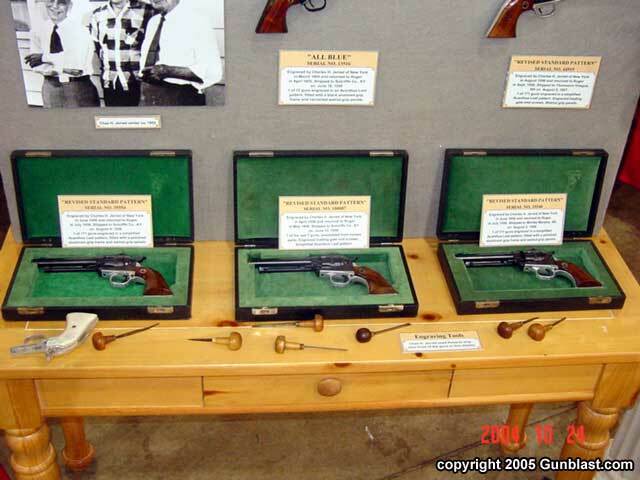 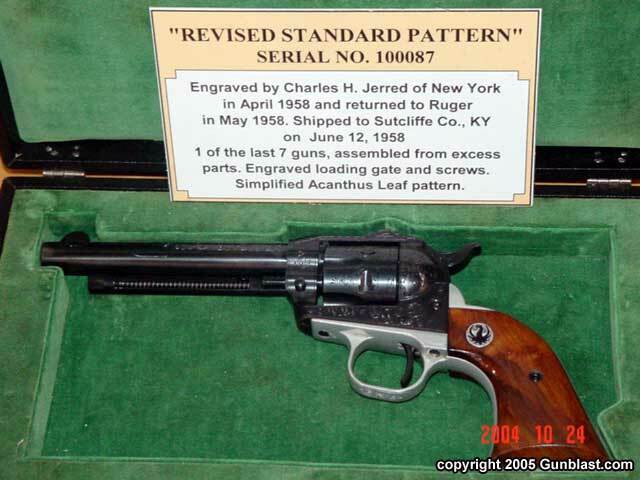 John also displayed an early Ruger ash tray of which only 5 or 6 are known, a group of tools used by Charles Jerred to engrave the guns on display. 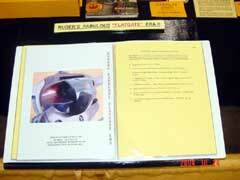 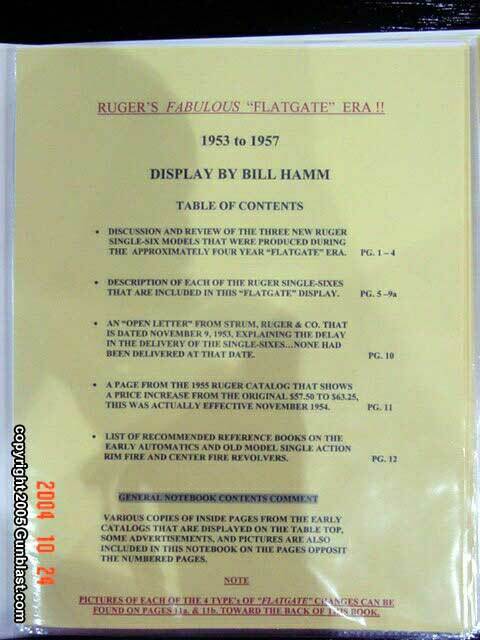 Rare and interesting photos also were included. 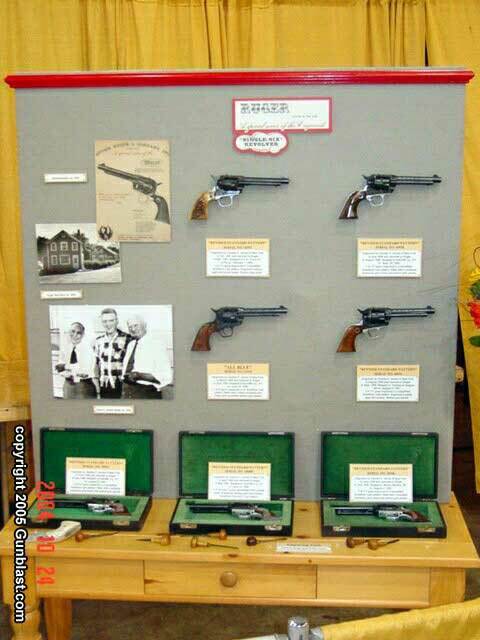 John seems to be trying to get in touch with his sensitive side, he had his wife Nina provide a bouquet of flowers at both ends of the display. 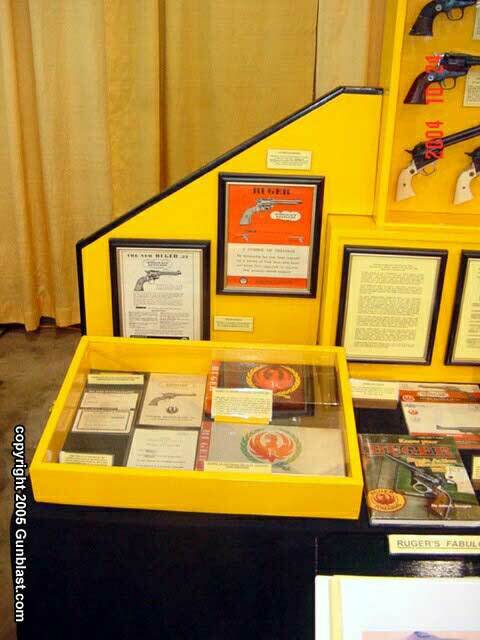 It is also the opinion of some that he has gone too far in his older years, he is now using the living room furniture for part of his display!! 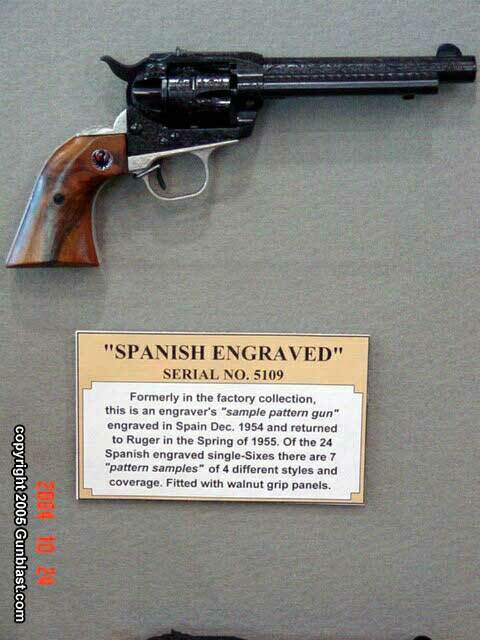 Assembled 1952, engraved by Cole Agee, Ft. Worth, TX. 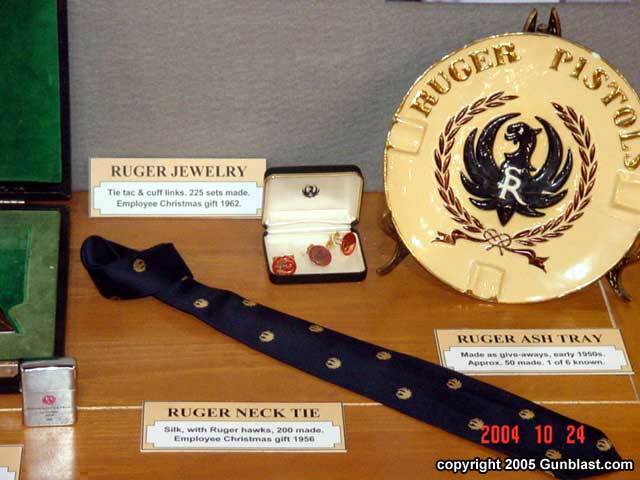 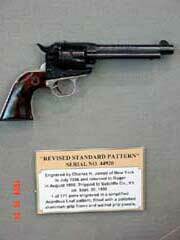 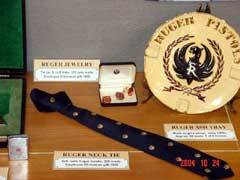 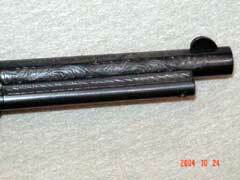 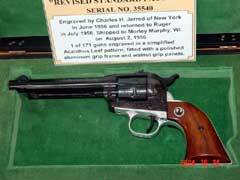 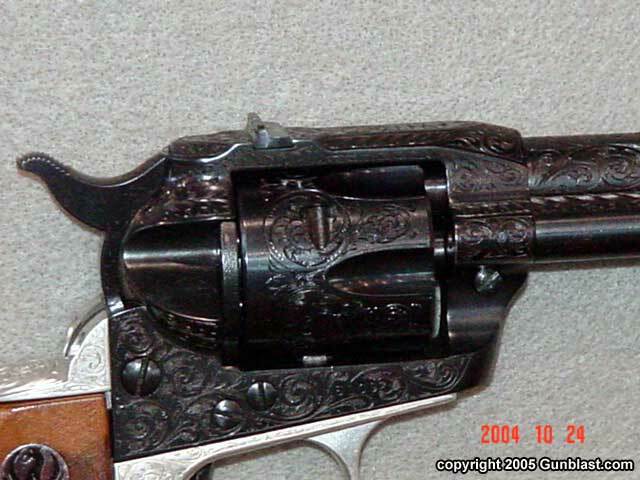 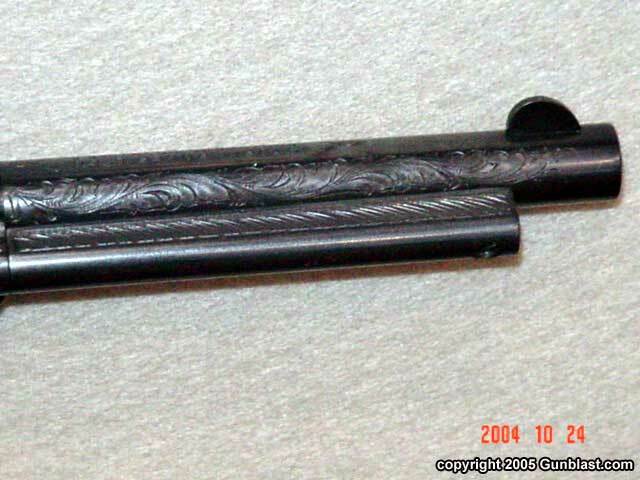 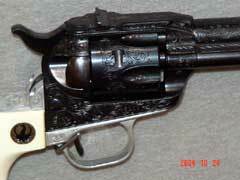 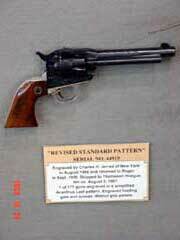 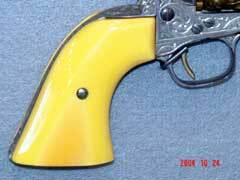 Backstrap is inscribed "To John T. Amber With the Compliments of Col. Ruger". 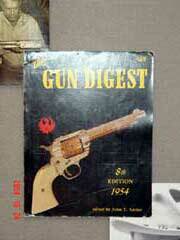 Appears on the cover of the eighth edition of GUN DIGEST - 1954. Ivorex grip panels. 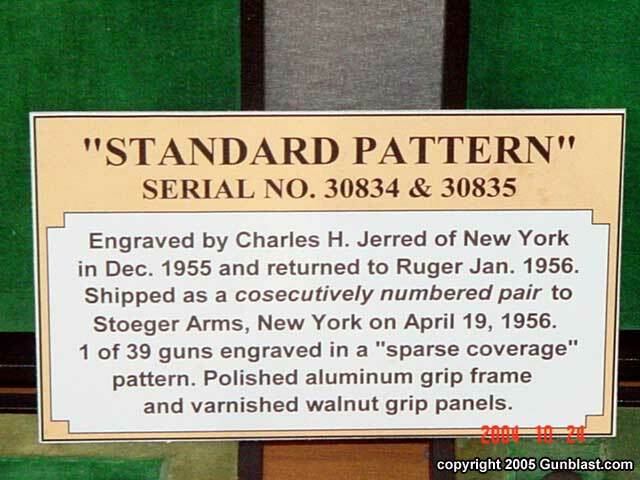 The display included the four major types of the standard Single-Six “Flatgate”, a early Greenwreath boxed Lightweight, an all blue factory engraved by Charles Jerred, a consecutive numbered pair of early “Flatgates”, # 804 & # 805, and a consecutive numbered pair of factory engraved “Flatgates” by Jerred. 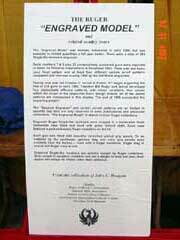 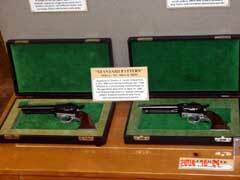 Also included was the only known consecutive numbered pair of Spanish engraved Single-Sixes # 5101 and # 5102. 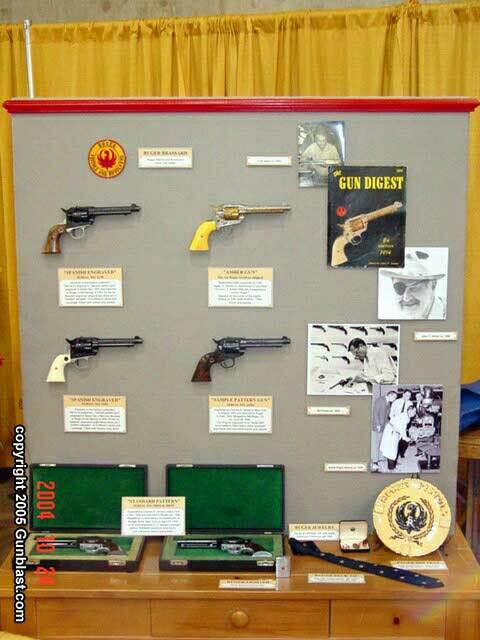 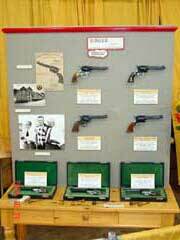 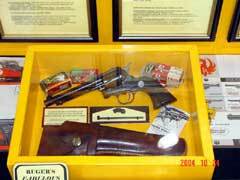 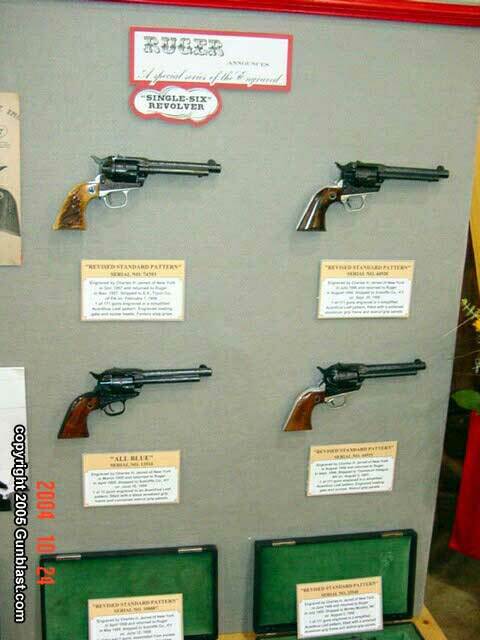 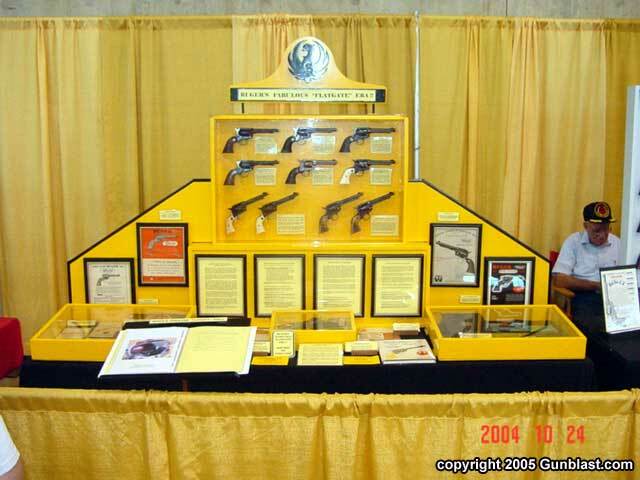 Bill’s “Old Companion”, a Flatgate that he bought when he was 16 years old and its old Heiser holster were also displayed. 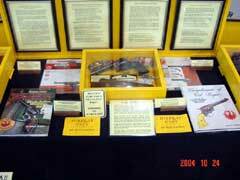 We all gathered Saturday night for a meal and the Awards distribution. 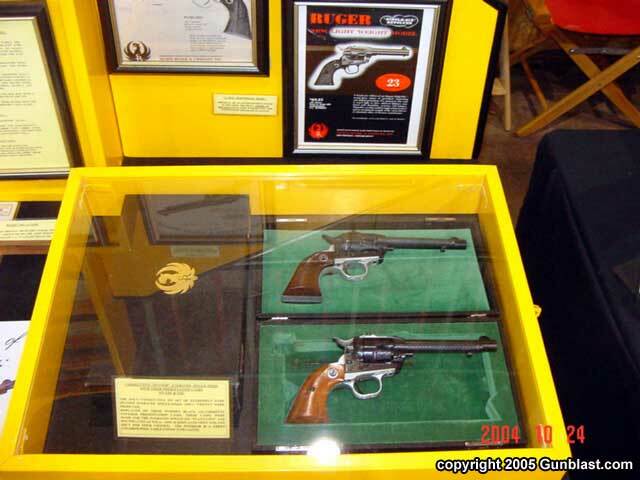 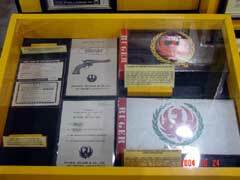 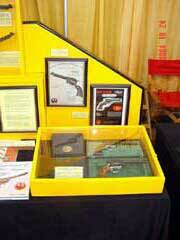 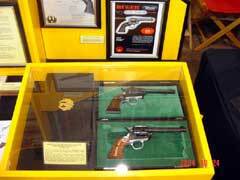 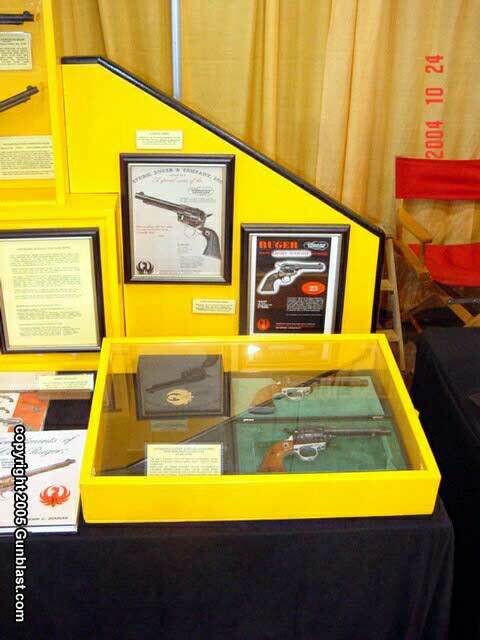 John Dougan presented several pieces of Ruger Memorabilia donated by Kurt Vogel of Sturm, Ruger, & Co., Inc., to each displayer. 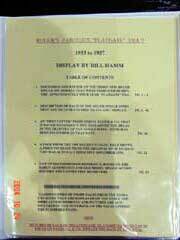 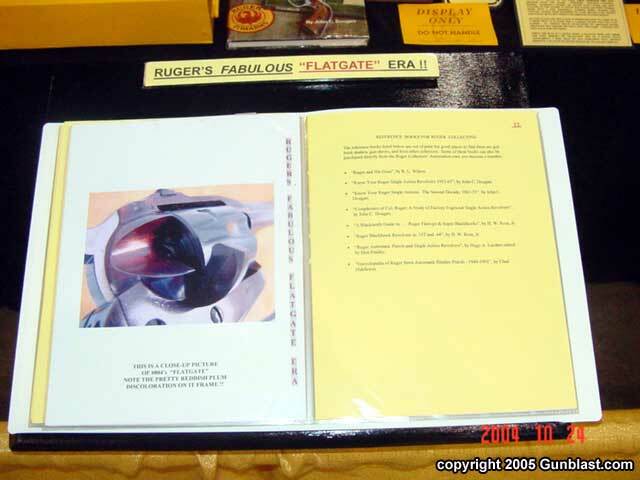 Specifically each displayer received a Ruger titanium golf club head and cover which is no longer being made. 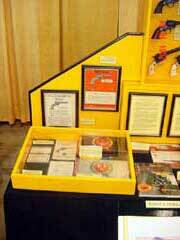 Chad Hiddleson also gives each winner a free year’s subscription of the Red Eagle News Exchange. Again we would like to encourage each of you to begin making plans now to attend next year’s October Tulsa Display show. 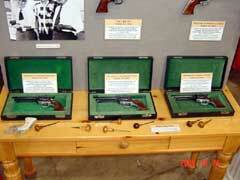 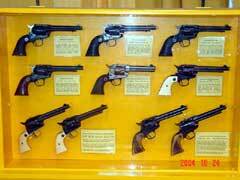 Reserve your display tables early, they were sold out this year and several displayers did not get to show their guns. 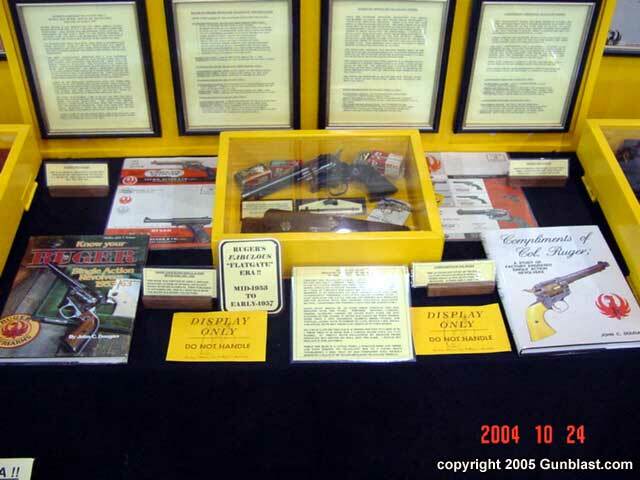 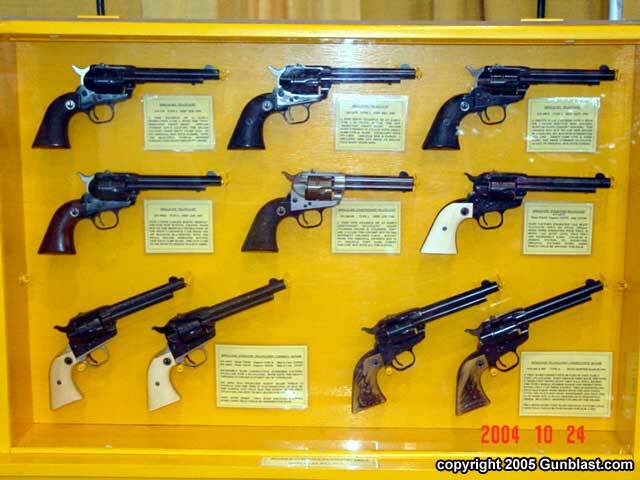 Not only will you enjoy it and likely gain fine guns for your collection (and probably get “hooked on Tulsa” like several of us other addicts) but it will help further and support our hobby and continued collectibility and desirability of the fine Ruger Firearms.